From his days as a precocious youngster in Lomzha to his service as rabbi of Belfast and Dublin, chief rabbi of the Irish Free State, and then chief rabbi of Mandate Palestine and finally Israel, Rabbi Yitzhak Isaac HaLevi Herzog blazed trails all his life. With a doctorate in literature by age twenty-five as well as degrees in classical and modern languages and mathematics, Rabbi Herzog was fully equipped with the education of the modern secular world as well as a deep immersion in Torah. All of these tools, together with his loving yet uncompromising Jewish faith, were brought to bear throughout a lifetime of leadership that traversed stormy days indeed. 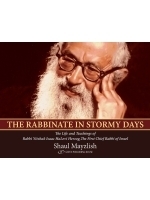 World War I, World War II, and the struggle of the fledgling Jewish state for independence made for constant challenges that the rabbi negotiated with grace and wisdom. Throughout his tireless activism lobbying presidents and popes on behalf of Holocaust refugees and then the nascent Jewish state, Rabbi Herzog wrote prolifically on topics in Jewish law in numerous books and papers that are still authoritative today. The rabbi’s life is a model of the struggle for balance between religious faith and modernity, a path that he navigated with a steadiness and warmth that made him both revered and beloved, in his day and into the present.